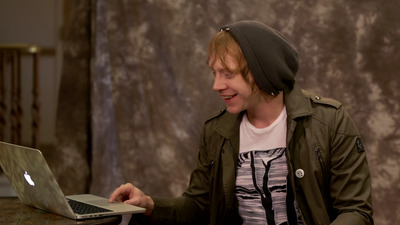 PottermoreRupert Grint gets sorted into a house on Pottermore. Turns out, Ron Weasley isn’t a Gryffindor. Rupert Grint, the actor who played Harry Potter’s best friend for 10 years in the film franchise, was sorted along with a few of his costars into their real houses via a video for Pottermore, J.K. Rowling’s website for fans to further their “Harry Potter” love. For fans, the Sorting Hat quiz is of utmost importance. It either confirms your intellect and places you in Ravenclaw or puts you with the badgers in Hufflepuff. After completing Pottermore’s rigorous and personal quiz, Grint was sorted into Hufflepuff. Bonnie Wright, who played Ginny Weasley, carried on the Weasley legacy and is truly a Gryffindor. Sporting sideburns and a mustache, Matthew Lewis, who played Neville Longbottom, grimaced as he was placed into Hufflepuff and then tried to pretend he wasn’t devastated. What is a Hufflepuff, anyway? Evanna Lynch, who played Luna Lovegood, reacted in the way that a true fan would when she was sorted into Gryffindor.